The "play" will be held in a non-traditional manner, using new approach to performance and staging that combines theatrical, cinematic, hypertextual and rhetorical dialectics, to create an engaging interweaving of acting, expert "teachings" and public participation play. Some of the inspiration for exploring this new form of presentation comes from methods of debate and commentary that are common in traditional religious studying situations, such as Talmud studies in Jewish tradition and debates and commentary in Tibetan Buddhism and Buddhist philosophy. This will be combined with aspects of contemporary mix culture and database art, in a way that media and discussion will follow from the negation and supplementation of materials that will be editable in real time to enforce the debate. The stage configuration will have no elevation or division between audience and the play-debate participants. 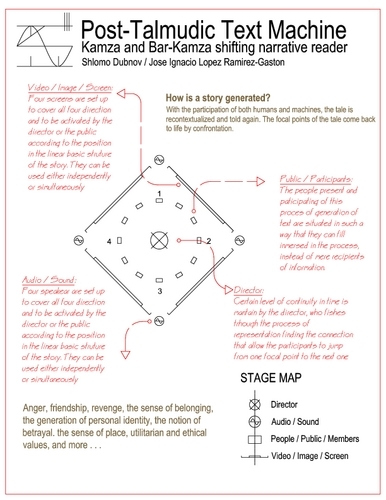 The story enactment will occur in the center of the room by a narrator and few actors. The debate tables will encircle it, surrounded by multiple screens and speakers. The audience will intersperse throughout the different debate circles, with varying extents of influence and participation in different annulus.